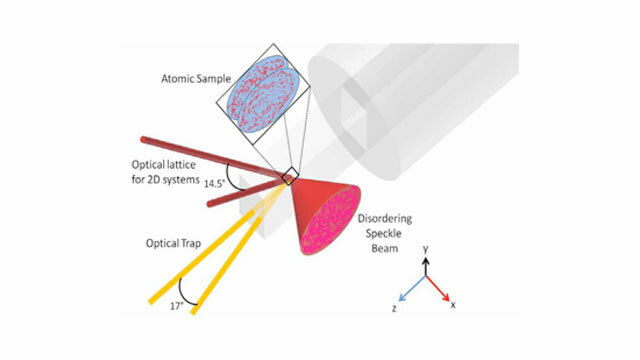 Figure 1: Two thin planes of cold atoms are held in an optical lattice by an array of laser beams. Still another laser beam, passed through a diffusing material, adds an element of disorder to the atoms in the form of a speckle pattern. Figure 2: Interference patterns resulting when the two planes of atoms are allowed to collide. In (b) the amount of disorder is just right and the pattern is crisp. In (c) too much disorder has begun to wash out the pattern. In (a) the pattern is complicated by the presence of vortices in the among the atoms, vortices which are hard to see in this image taken from the side. A new experiment conducted at the Joint Quantum Institute (JQI)* examines the relationship between quantum coherence, an important aspect of certain materials kept at low temperature, and the imperfections in those materials. These findings should be useful in forging a better understanding of disorder, and in turn in developing better quantum-based devices, such as superconducting magnets. Most things in nature are imperfect at some level. Fortunately, imperfections---a departure, say, from an orderly array of atoms in a crystalline solid---are often advantageous. For example, copper wire, which carries so much of the world’s electricity, conducts much better if at least some impurity atoms are present. In other words, a pinch of disorder is good. But there can be too much of this good thing. The issue of disorder is so important in condensed matter physics, and so difficult to understand directly, that some scientists have been trying for some years to simulate with thin vapors of cold atoms the behavior of electrons flowing through solids trillions of times more dense. With their ability to control the local forces over these atoms, physicists hope to shed light on more complicated case of solids. That’s where the JQI experiment comes in. Specifically, Steve Rolston and his colleagues have set up an optical lattice of rubidium atoms held at temperature close to absolute zero. In such a lattice atoms in space are held in orderly proximity not by natural inter-atomic forces but by the forces exerted by an array of laser beams. These atoms, moreover, constitute a Bose Einstein condensate (BEC), a special condition in which they all belong to a single quantum state. This is appropriate since the atoms are meant to be a proxy for the electrons flowing through a solid superconductor. In some so called high temperature superconductors (HTSC), the electrons move in planes of copper and oxygen atoms. These HTSC materials work, however, only if a fillip of impurity atoms, such as barium or yttrium, is present. Theorists have not adequately explained why this bit of disorder in the underlying material should be necessary for attaining superconductivity. The JQI experiment has tried to supply palpable data that can illuminate the issue of disorder. In solids, atoms are a fraction of a nanometer (billionth of a meter) apart. At JQI the atoms are about a micron (a millionth of a meter) apart. Actually, the JQI atom swarm consists of a 2-dimensional disk. 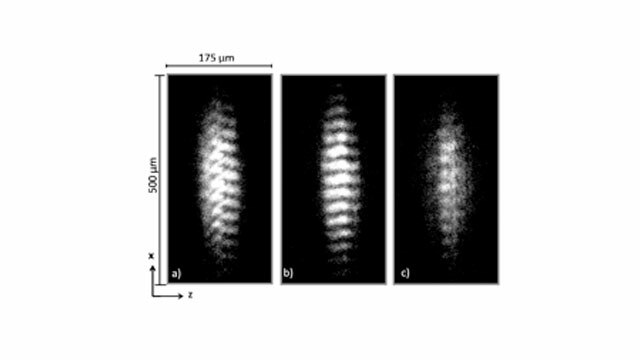 “Disorder” in this disk consists not of impurity atoms but of “speckle.” When a laser beam strikes a rough surface, such as a cinderblock wall, it is scattered in a haphazard pattern. This visible speckle effect is what is used to slightly disorganize the otherwise perfect arrangement of Rb atoms in the JQI sample. In superconductors, the slight disorder in the form of impurities ensures a very orderly “coherence” of the supercurrent. That is, the electrons moving through the solid flow as a single coordinated train of waves and retain their cohesiveness even in the midst of impurity atoms. In the rubidium vapor, analogously, the slight disorder supplied by the speckle laser ensures that the Rb atoms retain their coordinated participation in the unified (BEC) quantum wave structure. But only up to a point. If too much disorder is added---if the speckle is too large---then the quantum coherence can go away. Probing this transition numerically was the object of the JQI experiment. The setup is illustrated in figure 1. And how do you know when you’ve gone too far with the disorder? How do you know that quantum coherence has been lost? By making coherence visible. The JQI scientists cleverly pry their disk-shaped gas of atoms into two parallel sheets, looking like two thin crepes, one on top of each other. Thereafter, if all the laser beams are turned off, the two planes will collide like miniature galaxies. If the atoms were in a coherent condition, their collision will result in a crisp interference pattern showing up on a video screen as a series of high-contrast dark and light stripes. f, however, the imposed disorder had been too high, resulting in a loss of coherence among the atoms, then the interference pattern will be washed out. Figure 2 shows this effect at work. Frames b and c respectively show what happens when the degree of disorder is just right and when it is too much. Where does the JQI work go next? Well, in figure 2a you can see that the interference pattern is still visible but somewhat garbled. That arises from the fact that for this amount of disorder several vortices---miniature whirlpools of atoms---have sprouted within the gas. Exactly such vortices among electrons emerge in superconductivity, limiting their ability to maintain a coherent state. The new results are published in the New Journal of Physics (see reference publication below).